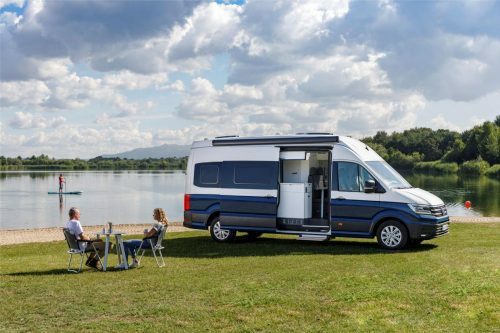 The eagerly-awaited Volkswagen Grand California will make its UK & Ireland debut at the Caravan, Camping and Motorhome Show at the NEC in Birmingham from 19-24 February 2019. The all-new Crafter-based campervan made its world debut at the Düsseldorf Caravan Salon in August. 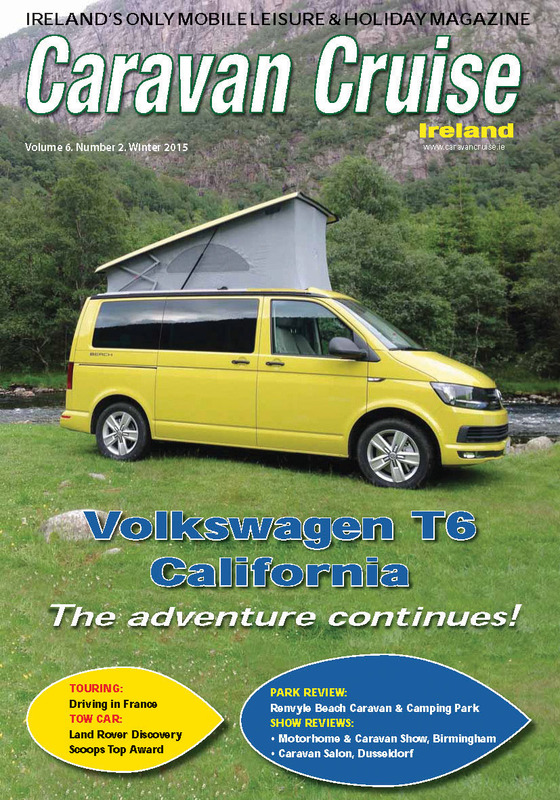 Retaining many of the strengths of the original Transporter-based California which celebrated its 30th anniversary this year, the Grand California’s appeal is extended by the addition of extra space, and a bathroom with toilet, shower, a fold-out wash basin, shelves, cupboards and a skylight for ventilation. Two different versions will be available: the ‘680’ and the ‘600’, which not only has a large sleeping area at the rear but also a high bunk bed for children. An electrically powered step, which moves out in front of the sliding door, makes getting in and out easier, while a two-part mosquito net in the door is likewise part of the standard specification. One innovative feature is the option to control the loudspeakers in the living area via Bluetooth. This makes it possible to listen to music independently of the infotainment system using a smartphone, tablet or laptop. Also available are details such as an additional roof-mounted air conditioning unit at the back, an awning, a rear bicycle rack and a camping table and chairs (which can be stowed in the wing doors). The standard gas heating can be expanded as a heating system to run on gas- or diesel-generated electric power. There will also be a solar panel system mounted on the roof, a satellite dish (for TV reception) and an LTE/WiFi hotspot (router). In addition, the Grand California will be available with the Crafter’s driver assistance and infotainment systems. The driver assistance systems include the Front Assist surroundings monitoring system with City Emergency Braking function, Lane Assist to help the driver stay in lane, Blind Spot Monitor for changing lane, Rear Traffic Alert for reversing out of parking spaces and Park Assist for steering into them, the sensor-controlled side protection system, Adaptive Cruise Control and a Rear View reversing camera. The Caravan, Camping and Motorhome show is the UK’s biggest showcase of motorhomes, campervans, caravans, caravan holiday homes and lodges, as well as tents of all sizes in the new-for-2019 Camping Zone, trailer tents, folding caravans and holiday accessories. As well as seeing new products, visitors can expect to come away with great ideas, inspiration, and advice on where to go and what to do on their next adventure. There are also ample activities to do at the show, whatever your interests, from a new Bear Grylls Adventure, through campsite cookery demonstrations to the ever-popular Top Dog Arena.